This section outlines how your service will interact with GOV.UK Pay after you integrate with the API.
! Warning This does not apply to users who use the payment links functionality. 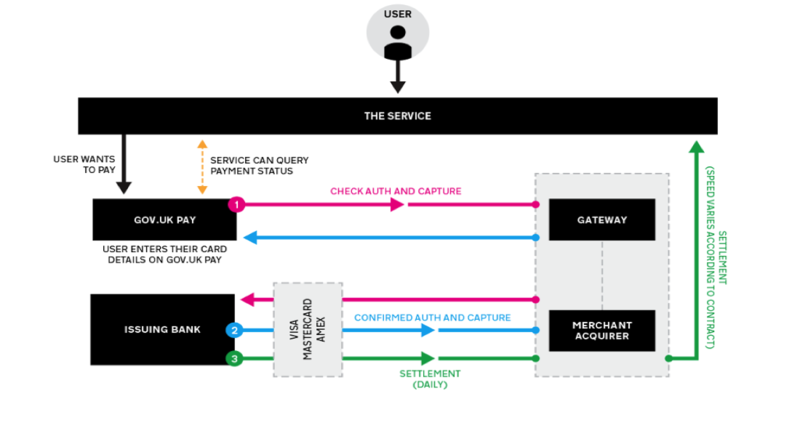 The diagram shows the relationship between GOV.UK Pay, payment service providers (PSPs) and issuing banks. The end user enters their payment details (for example payment card details and billing address) on the GOV.UK Pay pages. GOV.UK Pay verifies the payment with the underlying PSP. This page should make it clear to the user that they are about to pay for your product or service, with a clear call to action. For example a button that says Pay now or Continue to payment. The user will then be taken to the GOV.UK Pay pages to complete their transaction. The page should include clear information on what is being purchased. You do not need to tell the user that they are being taken to GOV.UK Pay’s pages to make their payment. GOV.UK Pay payment pages are responsive and work on both desktop and mobile. In the example page, when the user selects Continue, the service makes a Create new payment call to the GOV.UK Pay API [external link]. The body of the call is returned in JSON. amount: The amount in pence - in the example, the payment is for £145. This value must be a number data type rather than a string. reference: The reference number you wish to associate with this payment. The format is variable: if you have an existing format, you can keep using it with GOV.UK Pay (maximum 255 characters, and must not contain URLs). The reference number does not need to be unique. description: A human-readable description of the payment. This will be shown to the end user on the payment pages and to your staff on the GOV.UK Pay admin tool (maximum 255 characters, and must not contain URLs). return_url: A HTTPS URL on your site that the user will be sent back to once they have completed their payment attempt on GOV.UK Pay. This should not be JSON-encoded, because backslashes are invalid characters. With test accounts, you can use HTTP for return URLs instead of HTTPS. The start of the response confirms the properties of the attempted payment. The self URL (also provided in the Location header of the response) is a unique identifier for the payment. It can be used to retrieve the payment status details in future. The next_url is the URL where your service should direct the end user next. It points to a payment page hosted by GOV.UK Pay where the user can enter their payment details. This is a one-time URL. If more than one visit is attempted, it will give an error message. This page shows the description as well as the amount the end user has to pay, making it clear what they’re paying for. The user enters their payment details and selects Continue. GOV.UK Pay will then attempt a payment authorisation through the PSP. This checks with the card issuer whether there are sufficient funds available to make this payment. It also conducts anti-fraud checks. You can add a custom paragraph to a payment confirmation email at the email notifications page on the GOV.UK Pay admin tool. You can further customise using GOV.UK Notify to set up custom notifications. If you do this, you should disable GOV.UK Pay notifications. Users have different ways of recording this confirmation information. This can include screenshots, prints, PDF receipts to download, and writing down the reference number and other relevant information. Teams building services should be aware of all these behaviours, and plan accordingly. You can read more about confirmation pages as used in the GOV.UK Design System. Regardless of the payment outcome, when a payment journey has reached a final state, GOV.UK Pay will return the user to the return_url provided in the initial request. The Making payments section contains more details about how to match users to payments. To check the status of a payment, you must make a Find payment by ID API call [external link], using the payment_id of the payment as the parameter. See the Making payments section for more information about how you can integrate your service with GOV.UK Pay. If your user starts a payment but does not complete it, they can resume that incomplete payment. An example of this could be if they use an internet browser’s ‘back’ button during a payment, and then go forward by selecting links on your website. When a user resumes a payment, the next_url will take them to a screen that is appropriate for their payment’s current status. For example, a payment with a started status will resume at the card details input page. The next_url is a one-time URL. If a payment has already resumed using a next_URL, that URL will not be usable again. A payment cannot resume if it has a status of success, failed, cancelled or error. If your service tries to resume a payment of this type, the user will be sent to your service’s return_url. The return_url is the URL of a page on your service that GOV.UK Pay sends the user to after they have completed their payment attempt. Payments that are not confirmed and completed after 90 minutes will expire automatically. If the payment was authorised but incomplete, GOV.UK Pay will send a cancellation to the payment provider. This will raise a P0020 API error. An incomplete payment will have a status of created, started or submitted. These payment types have a next_url. The next_url is where you should direct the user next in the payment process. You will receive a next_url every time you query the status of a payment using the API.